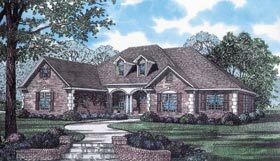 Question: Do the dormers on this plan bring in natural light or are they just a decoration? Answer: False dormers lights attic area; strictly for looks. Question: Do you have this floor plan with a different exterior?